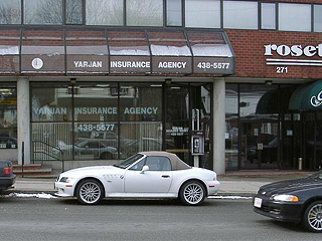 Welcome to Yarjan Insurance Agency, Inc.
Yarjan Insurance Agency, Inc., was established and has been serving the area from it's current location on 271 Main Street in Stoneham since January of 1990. Prior to that, the principal of the agency, Rad J. Yarjan was a top representative with American Mutual Insurance Companies of Wakefield, Massachusetts since 1980. Over 25 years of being in the insurance industry, the commitment for personal service and sensitivity to "cost" has never wavered. Yarjan Insurance Agency boasts one of the highest retention rates of clients in the business. You may want to find out "why?". ​We are currently placing our Private Automobile business with Commerce Insurance Company - The Number 1 Company in Massachusetts. We think you will appreciate their prompt and friendly service. Commercial Vehicles, trucks of all sizes, fleets, taxis and limousines are currently being placed with Safety Insurance Company and Arbella Insurance.